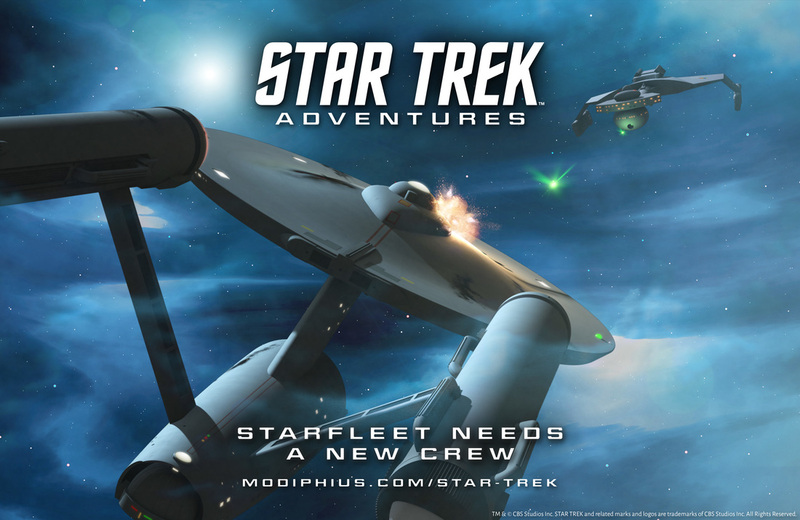 Today I have an interview with Chris Birch, the publishing director at Modiphius, about the new Star Trek Adventures game. When I heard about the game (a little behind schedule compared to most, I think), I wanted to know more right away. 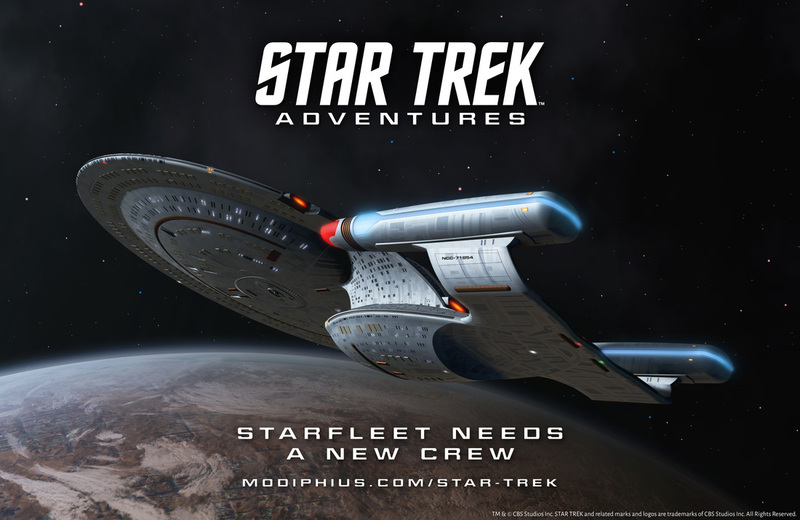 Check out what Chris had to say about Star Trek Adventures below! Tell me a little about the Star Trek Project. What excites you about it? I still remember avidly watching every episode of Star Trek as a kid with Captain Kirk. Long before Star Wars fueled my love for galactic empires, I was enthralled by the idea of captaining a ship on an epic voyage. Since then the waves of series and movies has kept the flame alive and so when we got to create a new roleplaying game I realised we could make it that personal journey that everyone who loved Star Trek since they were young has yearned for. What approach did you take for mechanics in the game? Why did you choose the 2d20 system, and how will it mesh with the "feel" of Star Trek? 2d20 is our house system first developed for Mutant Chronicles, then Conan, John Carter of Mars and Infinity. It’s a cinematic, system that is rebuilt from the ground up for each new version of the game to ensure it can accurately portray how that universe should ‘feel’. For example we’re working on ensuring phasers replicate how they’re used the shows and films - but note that’s different to how they actually would work. Federation personnel rarely use phasers on kill, instead mostly stun, and when heroes get hit it’s usually a short term thing, not life threatening. You don’t see people running about killing with phasers all over the place. There’s an emphasis on values for characters - as personal beliefs or values are often a vital part of the shows story. What experiences in the game are you making priority - interpersonal interaction, combat, ship combat, exploration, etc. - and why? Right now it’s making sure the basic nuts and bots feel right, but soon we’ll see starship combat, utilising the crew as ‘secondary characters’ (so you’re alwayx involved in the story), character creation and so on. What specific parts of Star Trek media (including specific episodes, concepts from the shows, character interactions) are the primary sources for your inspiration for the game, its fiction, and how the players will live in the game? These new books won’t just replicate all the usual ‘this is Starfleet’ content we’ve seen before but instead give more personal views from Vulcan Ambassadors, Romulan agents, Klingon captains on key events, starfleet regulations or make up etc. We want to get inside the heads of the different races to ‘feel’ how they see the universe more, and by linking these short excerpts to actual episodes we’re going to create loads of great plot seeds to inspire GM’s. In particular one episode Yesterday’s Enterprise became an inspiration for our living playlest, leading to the creation of Narendra Station and a major plot being developed by New York Times Best Selling Author Dayton Ward so throughout what we’re doing we’re drawing on inspiring moments that we all know and love, but in new ways. How have you approached getting diverse creators (artists, designers, writers) involved in the development and creation of the Star Trek game, and how do you see their inclusion positively impacting the product? The foundations of this includes a diverse team in the office who are involved in reviewing all the submissions, the financial management, art direction and community management to ensure a balanced approach. Beyond this we reached out to a diverse mix of writers, artists and editors - including many we met at GenCon and after. We’ve since hired an amazing team - people who’ve written and edited the previous editions of the Star Trek roleplaying game as well as other big titles from across the industry. We have the likes of Janice Sellers - Four time Origin Award winning editor for Call of Cthulhu, 7th Sea, Cyberpunk 2020 and Star Trek alongside Dayton Ward, New York Times Best Selling Star Trek author and many many more with most of the creative team still to be announced. Do you think that the new game will allow exploration of the progressive ideals that Gene Roddenberry promoted in the original series, and if so (or if not! ), how? Yes we do plan to build this in to the storylines, but also encourage the use values and believes that characters have as they contend with moral dilemmas, problem solving and conflict of all sorts. Often Star Trek played out these ideals through the eyes of an alien races storyline and we’d like to see new challenges facing humanity also developing through the wide ranging missions we’ll be offering. Thanks so much to Chris for the interview! I hope you all enjoyed reading and that you'll take a glance at what's coming with the Star Trek Adventures RPG!